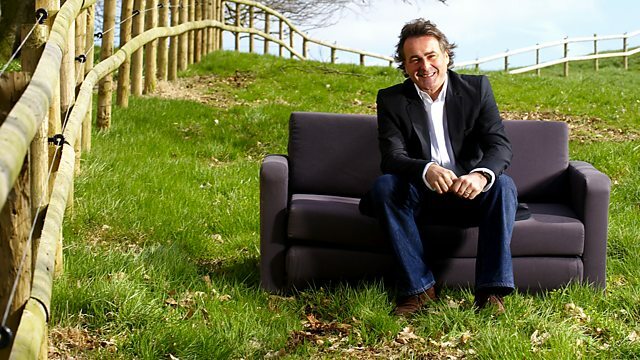 All That Glitters ‹ Ten of the Best 2011 ‹ Flog It! All That Glitters Flog It! Paul Martin presents an archive edition of Flog It! from Syon Park near London. He reveals a selection of glistening items that people have brought along to sell. Browse content similar to All That Glitters. Check below for episodes and series from the same categories and more! Welcome to a magnificent Syon House, a few miles from central London. The Percy family's private dining room literally dazzles and sparkles. literally brightens up the whole room. The overall effect of this house is one of unbounded treasures. It's like walking through Aladdin's cave. It's fair to say on Flog It, all that glistens is not gold. fly through the valuation doors. some of my favourite glistening objects. I hope they brighten up your day. This is a frightening looking object. Why have you brought this along? -I use it as a prop in my balancing act. -Do you stand on it? No. I balance it on my nose and walk over ladders. -I worked at Butlins 40 years ago. and I won a free holiday. -I have got a showing-off bit of paper. -Are you called Johnny Pierce? -Is that your real name? But tell me, you're not English? -No. I changed it by Deed Poll. -I've been over here 70 years. I am one of the fortunate people who escaped the Nazis. -I came from Berlin in 1938. My father sent me. -In the nick of time! -We'll come to that in a minute. -What have we got in here? -After the war, we were living in Tooting. with photographs of my grandmother. -Was it smuggled? I don't know. The people who sent it to me, I was in touch with them. colleagues of my father, my father worked with. They knew him and they knew of his fate and this came in my possession. Let's have a look at it. It's a very pretty ring. Set with three good sized diamonds. -1920s, what I call the Charleston era. but not necessarily the most commercial, in terms of design. -..three stone diamond rings, rather than such intricacies. -I'd like to put a valuation of 300 to 400 on it. With a fixed reserve, below which thou shalt not go, of £250. -Yes. My wife would be happy, the kids, too. and you take your balancing act home to practise. -John, thank you so much for bringing these in. 'help pull in the bidders? For me, they ooze style. I love them. Tell me where they came from. They were originally Marilyn's grandmother's. We brought them south during the 1960s. They've been lying in the loft for the best part of 30 years. -Never been on the table? Just lying in the loft for the best part of 30 years. -Do you like the design? Let me tell you a bit about them. First, they're super quality. The designs here are quite crisp. Have you ever cleaned them? cleaning will smooth down the design over a long period of time. Eventually, it decreases the value. Not only did he design houses, he designed silver to go in the houses. Let's look at some of the motifs a bit closer. We've got pendant swags of husks, a very neoclassical motif. and two-handled urns or vases. They really shout the neoclassical style. What age are they? We've got a hallmark on the bottom. Although in the late 18th-century style, they are a lot later. that tells me they date from 1901, so they're Edwardian English silver. Very heavy. What's happened is the candlesticks have been filled. but this is all silver. The sconce was made separately. there's a hallmark which matches the one on the base of the candlestick. So we know that was made for this candlestick. It would be the same on this one. -So, are you changing your minds? Do you still want to sell them? -but I would think that they ought to make between £400 and £600. They're very stylish, in excellent condition. I think they'd look fantastic on MY dining table! 'Kate thought they would polish up rather nicely at auction. 'Stay tuned to see how well they did. -You have brought in the most fascinating object today. It was found in my mother-in-law's drawer after my father-in-law died. We came across it with lots of other bits and pieces. I thought perhaps it's gold, and it's sat in the drawer ever since. Have you had it tested to see if it's gold? No, and it's got no marks, as far as I can see. Well, it's an intriguing little thing. It just looks like a locket. Indeed, that's what it is. We can open it up. We've got a lovely little interior cover. A little dove of peace engraved on it. we've got this lovely pierced top for a vinaigrette. 100, 200 years ago, the place stank. to keep your pecker up, I suppose. is that during the Victorian period they wore really tight corsets. It constricted you, so this was a way of bringing you back round. -It's fair to say that it's had a hard life. A lot of the pattern is a bit rubbed and it's had reinforcement on it. -..and the vinaigrette. I don't think this is the original chain. But a lovely little object. This is a Victorian locket. We could be looking as far back as the Crimean War. -But coming to harsh practicalities, you've never had it valued? I'm going to plump for the auctioneer's cliche. You've got it! With an 80 reserve. -See where it ends up. -Very happy. It just sits in a drawer. 'But did the locket interest any bidders when it went up for sale? It was found in my father's house. He died ten years ago. in a cupboard under a lot of linen. I'd never seen it before and we know nothing about its history. -We can tell you all about it. Have you used it? I had it on my desk for a couple of years, then it started to lose time. I put it back in its box and hid it away. I expect to find a carriage clock in here. A little button releases the top. carriage clock, by just pulling that panel up there. There's a slot in the back to put it in. Ah! This is a very special carriage clock. It's got three wonderful panels. We'll come to those in a minute. The case itself is brass. I expect the case is made in England. I expect the movement to be French. literally translated from Italian - they are panels from Italy. It's a miniature carriage clock and I think it's absolutely sweet. -I can see that there is a little bit of damage on the back panel. That's an expensive job to do. Somebody will need to repair that. Otherwise the pieces of stone will fall out. But the side panel is perfect. Did you think about the value when you had it tucked away? It's a nice looking thing. I would say that it has value because it's pretty. -But I know that it's not in terribly good condition. I think it would be worth 300 to 500 all day long, in perfect condition. I think 200 to 300 is the right estimate. Reserve at 200. The auctioneer should work hard on this. it'll be the best in his auction. 'Time will tell whether that went for as much as Charlie suspected. 'First, let me refresh your memory with a quick recap. 'would make a big impact on the bidders at auction. 'Kate Bliss thought these silver candlesticks oozed quality. 'Did they light up the saleroom? 'Did this locket that Mark Stacey spotted go for gold at auction? 'And it's Charlie Ross's head on the block with John's sensational ring. 'The ring is first under the hammer. Adding a real sparkle to the saleroom - John's diamond ring. and entertaining us with your balancing act stories in Butlins. Lots of tales here, Charlie. -This ring had an amazing journey. It's come back to the family. -Yes. Inside a photo album. Cut out. -Smuggled, really, into the country from abroad. We had a chat to the auctioneer. You don't know this. -Cliff said, "Totally agree with it. Should do the top end." The diamond ring, circa 1920. -Where will I start for this one? 300? 200? I start at 200. 210. 220. 230. 40. 50. £250 with me. Upstairs at 450. It's in the room. 470. At £600. 600. 20 anywhere else? Great result! You've got to be happy. I'm very happy. My wife's happy. Most probably she's fainted already. Got to give her the kiss of life! We've only been married 63 years. -Thank you so much for entertaining us today. 'and well over the top end of Charlie's estimate. -You're avid auction goers, Marilyn. I'm sorry to bring bad news, but I've had a chat with the auctioneer. You know I was very excited about them and loved them. I think they're super quality and we set the estimate at 400 to 600. Simon thinks I've been generous and he thinks, in the market here, they might struggle at that. but he has cautioned me so I thought I'd just forewarn you. -You never know who's here. -If they meet the reserve we'll be happy. The very handsome pair of Edwardian Adam-style candlesticks. 420. 440. 460. 480. 520. -Forget everything that I said! 700. And 20. 720, standing then. -Yes! Double what we thought. 'A fantastic result! Those bygones did some great business. -It's quite an interesting item. Just about to find out. Why are you flogging this? It was found in a drawer when we were sorting out my husband's mother's effects. It didn't mean anything to us so we thought we'd come and have a go. Hey presto! Here we are on Flog It! Right, let's do our best for you. A vinaigrette with hinged covers. I'm bid here £65. 65. 75. 80 and I'm out. At £80. Five. -We need to double that 60. -That was really, really good. 'A golden result, doubling Mark's estimate. -£200 to £300 put on this by our expert Charles here. We're all hoping for that top end, £300. I could see it creeping over top estimate. He said, hopefully! This is where the excitement is! Pressure's building right now. We're bigging this up but you never know what's going to happen. The pretty little late 19th-century gilt brass carriage clock. -..The lowest commission bid is £500. 700. £750 is what I have with me. Is there 800 in the room? Any more? With me to be sold, then. Straight in and straight out! Blink and you'll miss it. £750! how individual that little clock was. -There's tears in your eyes. -I know. I want it back! That sparkling treasure of Richard's made a tidy sum at auction. people will go the extra mile for something original. as our experts will tell you. ask a fellow colleague and look for identification marks. Take this little silver hand mirror. and where it was made by the stamp of the assay office. tells me it was made in Birmingham. I went to the assay office in Birmingham in 2002. I want to let you into a little secret. Our experts love valuing silver because it's so easy to identify and date. Everything made of precious metals in the last 700 years in Britain has been hallmarked. There's only four places you can have things hallmarked. This is one, the Birmingham Assay Office. A hallmark is a guarantee of quality. and proven to contain a certain amount of silver, gold and platinum. I've brought Sarah's trinket box to show you how the system works. Hallmarks have been around since the 14th century. we can really show you how that system works. There are usually four marks. The first mark to look for is the assay office. This tells you which assay office tested the piece. An anchor means it was tested at the Birmingham office. London used a leopard's head, Edinburgh a castle. Sheffield used a crown until 1975. Then the symbol became a rose. The next mark proves the metal's up to standard. The first standard for silver is sterling silver, 92.5% pure. a lion walking to the left with one paw raised. The third mark shows the date an item was hallmarked, as a letter. Until 1974, each assay office used its own sequence of date letters. before you could date it. Between 20 and 26 letters of the alphabet are used. When it got to the end, they started again at A. To avoid confusion, they changed the A and the shape of the shield in which it appeared. This A is a Birmingham mark for 1773. This A, also a Birmingham mark, denotes 1798. The fourth mark is the maker's mark or the sponsor's mark. Every silver smith or factory was allocated this mark, so that an item could be traced back to them. but early marks were in the form of a symbol. This is Sarah's trinket box. You can just about see the maker's mark. and the letter A on the right is for 1925.
you can find information at the library, or get yourself a pocket book. It's what all the experts use and you can become your own expert. 'I now introduce you to more of my favourite glistening items. Nick, you've brought me a bit of Somerset wildlife! -Where did this little fellow come from? Funny that it's your grandfather's. My grandmother died when she was young. So it was just my grandfather. I see. It is absolutely a lady's item. It's a little pin cushion, which is why we have these perforations. either a porcupine or hedgehog, I haven't made up my mind. We'll call him a hedgehog. ..full of little pins, and you get the absolute effect of him. all the way through, after the First World War, into the '20s. -You know that it's been in your family a long time. Any idea when it might date from? -All I know is my grandmother died by 1938. -You know it's certainly before then. -Before then, I would think. There we go. We've got a full set of hallmarks. The maker is L&S, a good company, Levi and Salaman. It is Birmingham and it's 1904. -..a little Edwardian hedgehog. Yeah. Which is quite nice. These little pin cushions were made in forms of frogs, kangaroos, lions. Every animal, I've seen as a pin cushion. The little hedgehog is probably one of the more common ones. Were they mass produced or...? Good question. They are mass produced. Around its nether regions and over its top, you've got a seam. and you basically have two that you'd solder together. Then you solder on the little feet, so very easy to manufacture. With a little kapok stuffing to take the pins. They're quite collectable. Have you any idea what it might be worth? I was thinking £20 to £30. Where's my wallet when I need it? No, they're really sought after. The last two or three years, they've shot up in value. which is easy to take out, £100 to £150. -make 2,000 or 3,000, so it gives you an idea. -We're safe at that, if you're happy to pop it into auction. We'll put him in and see if he shuffles to a profit! 'Find out whether that silver item delivered a sterling result later. 'First, here are three gems that I can't resist showing you again. You thought it was worth £10? Didn't think it was worth anything at all. 'when it clocked up a whopping £400 result. 'Alison's silver salt and pepper birds were stunning. 'They didn't go cheap, selling for a sparkling £600! Around this area, it would have been awarded to captains of industry. 'making £210 when the hammer came down. 'Back to the rest of my glittering ten of the best. 'I'm taking you to Melksham now. -Now, you're Gay and you're Lucy. -Are they all family pieces? You must have come from an exceptionally wealthy family. -My grandparents and great grandparents had a tea plantation in Ceylon. -When did they finish with the plantations? -into the early part of the 20th century. and investing in family silver. They're all quite attractive pieces in their own right. It's a replica of a Charles II cup. it's got this wonderful acanthus leaf decoration. First a polished leaf, then in a chase leaf, which is rather nice. The beauty of this is the finial. It's all leaves enclosed, and it's pierced all the way through. But the thing I LOVE is this little piece here. -I'd like to think this was for place names. with the name of the person. That's even got glass eyes. It's a good little piece. I think that's going to be quite sought after. Then we have quite a conventional tea caddy of a Georgian design. dating from the early part of the 20th century. Price. I think you're going to achieve between £350 and £400. But the auctioneer, I'm sure, will separate them into separate lots. I think the most important piece for reserve is the covered cup. I'd hate that to go under 200. -So do we put a reserve of 200 on that? And I think the other pieces we should let run in the saleroom. -They'll find their own level. -Shall I have the pleasure of seeing you both at auction? -No. I'll be on holiday. -Where are you going on holiday? -Majorca. Perhaps a bit warmer. -Don't spend the money in advance! -That's what I want it for! -I hope we can guarantee another holiday out there. 'Did that family silver earn Gay and Lucy enough air miles to get to Majorca? 'We'll find out a little bit later. I can feel my heartbeat racing right now. I'm ever so excited. I know a lot about Newlyn copper. I was brought up in Cornwall. of holding two or three items made by one of the masters, John Pearson. When I first saw this... Look at that! How lucky are you two? -What did your grandmother do for a living? -She went into service when she was very young. Came from the country to London, to Fulham, and went into service. -Working for an important family? -And they gave her this? when he was really tiny, and he always liked it. And the lady gave it to him, but that's as far as I know. -We're talking about 80 years ago. My dad was born in about 1911, I think. -So this was nearly new when they got it. -It's not been out of your family. -No-one's got their hands on it? -So this is fresh to the market. This is cracking provenance, absolutely cracking provenance. was from 1890 to 1920. So this is at its inception, in the very early years. because of the light, the scenery and warm weather. He felt sorry for the local fishermen. they couldn't go out to fish, so he taught them handicrafts. Of course, copper was readily available from the mines. They repaired the fishing boats with sheets of copper. He thought, "I'll carve some moulds. "They can hammer sheets of copper on the moulds and make lots of things." That's called repousse work, and you can see the hammer marks. All the fishes have come from a mould that's been hand hammered. That's one sheet of copper. was John Pearson - definitely a name to look out for. You have a piece of John Pearson. He took over from John Drew Mackenzie. It doesn't get better than this, it really doesn't. It's unbelievable that we've had it in our house. And didn't know about it. Have you had any offers on it? Have you taken it anywhere? -Before you knew Flog It was coming? Well, I almost didn't come because they offered me £60. -In an antiques shop, yes. -Yes. And I said, "Oh, no." With a reserve at 400. -Shall we flog it, then? and not just making my day, but maybe my year. I've handled a piece of John Pearson! 'I'll reveal how that did when it went to auction in just a minute. 'First, here's a recap of my final selection of sparkling stunners. 'Michael Baggott was fascinated by this prickly customer. 'David Barby thought Gay and Lucy's Ceylon silver would shine bright. 'You don't see many of these John Pearson copper pots. 'Did it turn anyone's head at the auction? Pin cushions are one of the most saleable bits of small work. But you transfixed me with hedge-laying. I want to forget the auction and go lay a hedge. -Let's hope the bidders don't find it too prickly a customer. 'The Edward VII silver pin cushion in the form of a hedgehog. 'I'm assured there's no fleas on it. ..160. 170. Commission bid of £170. 180. 190. 200. And ten. The book is out. Distant bidder 240. 50 will you? Are you all done? -Can't stop pin cushion collectors! ..It's against you. Gentleman's bid at £260. Selling... 270. You're back in, madam. -£280! It's the hedgehog they fell in love with! -You think something that small, it's a lot of money. In the pin cushion world, it isn't. The only thing that held me back was that little dent. That has to be put right. It made what it was worth and a little bit more, I think. so I was going to replace them. -The hedgehog's going to buy some chickens? We've got Lucy. Unfortunately, not Gay, but Gay's son, Paul, Lucy's husband. Now, you've been searching the garden shed, looking for the rest of the silver. I'm pleased now we've got a pair of owls. That's going to put the value up. I had a chat to Alan, and he's split the lots up now. Salts, mustards, good little lot. Somewhere around about £90? 90 I'm straight in. -At 90. Is there 100...? ..At £90, am I done? Next, I've got a very cute little tea box. Very pretty thing. £100 again? £100 for this pretty little tea box? 80, thank you. 80 I've got. 90. At 125. 125. 130? 130. Brilliant! We did a little better that time. £150. A two-handled cup or porringer. I've got three with me. ..At £360. Is there 70, quickly? Next, 378, the menu card holders. I can start at £100. At 100. -Good job you found the other one! -You've got to be happy with that. But that's plenty of spending money. -After our appearance fee, there won't be a lot left for her. -Tell her the good news. -Tell her she got £200. 'They really struck gold with that silver. Newlyn copper doesn't get any better than this, by John Pearson. Quite honestly, it never comes on the market. It belongs to Maureen and Derek. I'm so pleased you made it in. -It's going to be exciting. -You were initially offered £50 for this. Hopefully, we'll turn that into £600. We've got commission bids. We've got the room packed. Let's watch this go, shall we? Yeah? Ready? Here we are. A copper vase of ovoid baluster form decorated with fishes. And I can start at four hundred and...60. Your bid. 680 in the room now. Oh! Come on. Come on. The bid's against you. 800. At 850. The bid's against you. Oh, what a wait! At 850! Selling then, at 850... Sold! It's found a new home. Somebody's paid the right price. That has made my year! A bit of John Pearson Newlyn copper! That copper vase was a sparkling sensation! It easily reached the top end of my estimate. I'm sure it brightened up Maureen and Derek's day. Sadly, there are no more treasures left in my chest. Join me again for another trip through the Flog It archives. Until then, from the splendid Syon House, it's goodbye. Paul Martin presents another archive edition of Flog It! from Syon Park near London. He reveals a dazzling selection of glistening items that people have brought along to sell. A rare John Pearson copper pot lights up the saleroom in Woburn and an extensive collection of silverware strikes gold in Chippenham. Also, Paul visits the Assay office in Birmingham to get to grips with how hallmarks actually work.